Zambia’s national champion FM Daniel Jere bested the field of 104 players to take the 2012 Harvey Products Open. He was equal first with IM Chitumbo Mwali with 7½/9, but had superior tiebreaks. There was a sextet of players tied on 7/9. This tournament was a tune-up for the 2012 Chess Olympiad in Istanbul, Turkey beginning at month’s end. The men’s team comprises Jere, Andrew Kayonde, Gillian Bwalya, Nase Lungu and Stanley Chumfwa. Olympians Kayonde ended on 6½ while Chumfwa had 6. Tournament coordinator Bwalya Chileya announced that women will play with men as a training ground for Turkey. “Competition at the Olympiads is very stiff and one way of helping our female players, is to have them play our men at this tournament,” Chileya asserted. The women’s team consists of WCM Epah Tembo, Constance Mbatha, Joy Mtine, Linda Haamonga and Lorita Mwango. Tembo was the top female scorer with 6/9 while Mwango got 4½. First place was K2 million with the second placed player getting K1.5 million. Third and fourth finishers got K1 million and K500,000, respectively. I am pleased with jere’s consistency in local tournaments, especially with regards to beating unrated players. 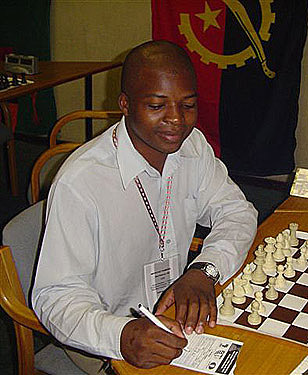 It inspires confidence in the zambian chess fraternity. However the erratic performances of the others (nase lungu,stanley chumfwa, andrew kayonde, kelvin chumfwa, richmond phiri, gillan bwalya, chitumbo mwali and musatwe simutowe) against unrated local opponents who always fail to make it into the national team, is worrying. The olympiad starts less than three weeks from now and so the players on the team must improve in time to face tough opposition that awaits them. There needs to be more frequency in playing decent tournaments. This is the problem in many developing federations. Also note that it is hard to know how strong unrated players are. When you do not have many tournaments some players can be quite strong yet with low ratings or no ratings at all. Well Done Daniel! I see IM. Chitumbo shared the post with you, congrats are also in order for him! I ONLY WISH ZAMBIA COULD HAVE SLATED THE BEST PLAYERS FOR THE OLYMPIAD!!!! !